There are 16 cat videos tagged with puppy. We aren't sure of the specifics of this situation but we are sure that it's adorable. 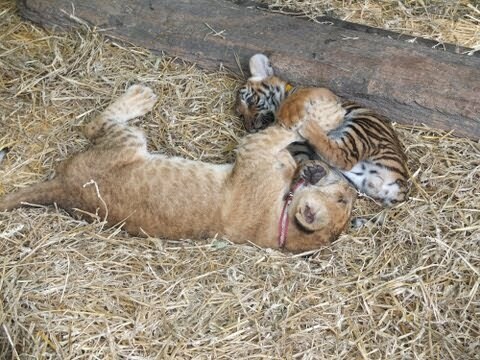 A tiger cub and lion cub play with some adorable puppies. Ruggles is a shy Shih Tzu who was rescued as a puppy from a puppy mill. Chompers is an adorable cat, rescued at just two days old when she was found in a yard. The two cute baby animals quickly became friends. The lucky puppy and kitten were adopted, but not together. As they grew up, Chompers because a little too rough with Ruggles so it was decided that they would be happier separate. 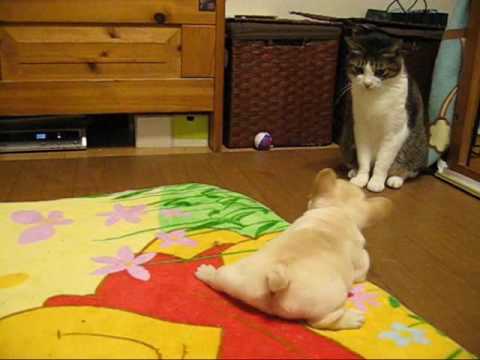 Chai, a French Bulldog puppy takes on a cat who couldn't care less (typical cats, right?). The adorable tan puppy tries to bark and snarl but just ends up being cute. While others might be distracted by another cute puppy and its mom who enter the scene playing with each other, Chai's only focus is on the cat. 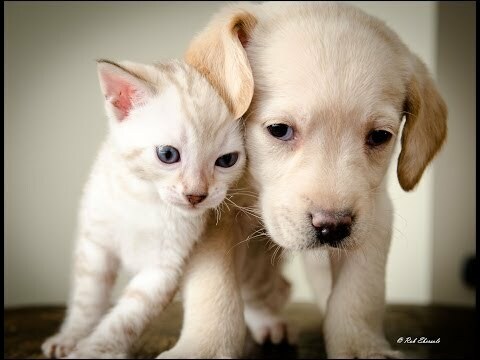 A Snow Bengal Kitten & Labrador Puppy Becoming Best Friends! A tiny snow bengal kitten and a tiny yellow lab puppy snuggle up to each other. The puppy looks so sad but seems tolerant of the pesky kitten trying to cuddle with him. In the end, they fall asleep in the cutest positions. 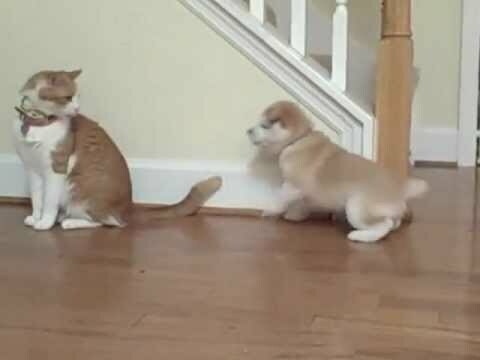 Cat unimpressed by Shiba Inu puppy. We think that only humans get insanely annoyed by their younger siblings, but oh, are we wrong. Watch how five-year-old Bella plays it cool and completely ignores her new brother, five-week-old Shina Ibu puppy, Sawyer, does everything he can to get her to play with him. What Bella has to her advantage is that she can jump up onto any surface so that Sawyer can’t get to her! But don’t you worry, I’m sure that Bella and Sawyer will be cuddling like the loving siblings they are any day now. At the San Diego Zoo Safari Park in Escondido, California a cheetah cub and Rhodesian Ridgeback puppy snuggle up friends. 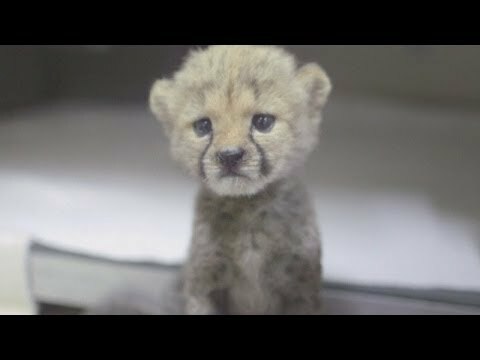 The cheetah, Ruuxa, was abandoned in the wild by his mother and the puppy was chosen as his companion. By living with Raina, the zoo hopes the cub will learn social skills. A puppy was abandoned at birth, and now an unexpected mom is stepping in to help. FOX 8's Annette Lawless shows us the touching story an unlikely mother giving a dog a second chance at life. Introducing two little buddies should always go this well! The puppy and kitten start sniffing each other to fulfill their curiosity and figure out just what is the other animal before them. The labrador begins licking his newest friend (which this kitten doesn’t like very much) and nuzzles up against him. The two should be the nicest of friends growing up, which will make any other videos of them just all the better!